Illusionists employ subtlety and distraction to impose their will upon the enemy. 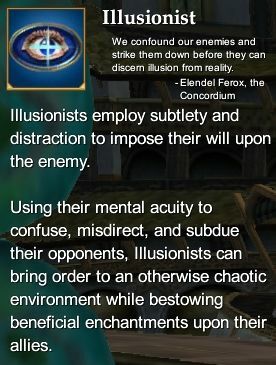 Using their mental acuity to confuse, misdirect and subdue their opponents, Illusionists can bring order to an otherwise chaotic environment while bestowing beneficial enhancements upon their allies. For more class-appropriate armoer sets, see: Illusionist Item Sets. This page last modified 2011-08-25 22:54:50.